Online Backup is a service that enables PC owners to safely and securely store files and information in an offsite location1. That way, should a persons computer get damaged or destroyed they still have a way to retrieve everything that was on the computer. Online Backup systems can be scaled to meet your personal at home needs or the needs of a business. 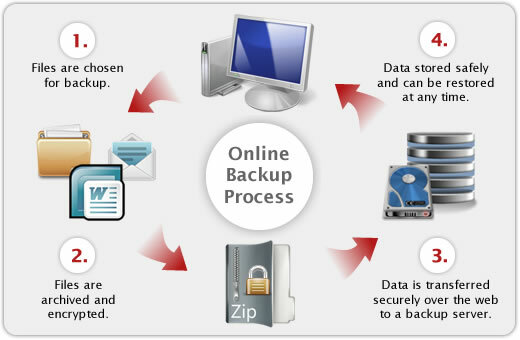 Generally, Online Backup consists of a software package sold by a company that must be installed on your PC. Once installed, the software can be configured to run on any time basis (usually daily) at which point it will collect all selected data, compress it, encrypt it, and store it in an offsite server location. In the event of data loss (virus, hardware malfunction, etc) you can access your backed-up information to restore anything your lost. Mozy is an online backup company offering software packages for anything from a single home user to large businesses. They offer packages made to backup information from comupters as well as files stored on a business server.